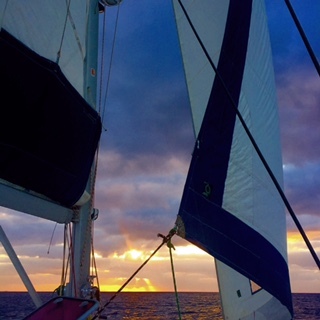 Today’s sail from Bimini to the Grand Bahama Island, was a wonderful one. We were in following seas with full sails for the entire 11 hour trip. The only land we saw while en route was a tiny Cay called Great Isaac. There is a 150ft lighthouse there which was erected in 1859. It has been said than when the moon is full, strange noises can be heard on the island. The story is that in the late 19th century, there was a ship wreck on the island, and the only survivor was an infant. The child’s distraught mother wails in grief every full moon. In 1969 the island was found to have been abandoned by its two keepers, who were never found. Many believe that they were just two more victims lost to its mysterious forces. We had a fishing line out all day, but at one point something big took the entire lure and some line with it. We are running short on lures, and I have been looking at websites to purchase materials so I can make our own. I am excited to learn. At one point in the day Emma was so sweet and surprised me by defrosting and cleaning the freezer. She is such a thoughtful little Angel. Danny takes good care of his drone and really enjoys flying it, so this afternoon Mycah frantically announced that the drone had fallen off the stern and into the water. Danny and I were at the helm and we both came down to see, and couldn’t see the case floating on the water. Danny took one look at Mycah’s face and knew she was pulling an April Fools on him. Jude got Aidan by replacing one of the water bottles in the fridge with a bottle of sea water. He drank down a big gulp and the rest was shared with the deck. The anchorage we entered into is a mixture of really cool and just plain weird. The entrance is lined with a wall of boulders off to each side, with a thick growth of tall pines mixed with some tropical plants covering all the land masses. As we motored in it felt like we were working our way up a higher altitude river. Soon the large boulder walls disappeared and were replaced by concrete walls, which for a maze of water ways. We are anchored in a cul-de-sac to the side of one of these water ways. So here we are, with an entire concrete anchorage to ourselves and we are surrounded by beautiful pine forests. This does not feel like the Bahamas but it sure is beautiful. Okay we are here in NM with some friends who travel and FISH alot. They said giant squid is great to use and shrimp will catch snappers that are good eating. ….. hmmmm. They said the squid is tough and you can use over and over!! Good to know. Thank you!! Awesome. Tell him I need lessons in salt water trolling lures.